Soho Round Glass Beverage Dispensers - Cal-Mil Plastic Products Inc. This dispenser is great for parties, catering, or any buffet. It goes great with any other items from the "Soho Collection" and adds a fresh and new twist to any table! Made from crystal clear glass, this dispenser beautifully and stylishly displays colorful juices, water, iced tea, and any other drink of your choice. 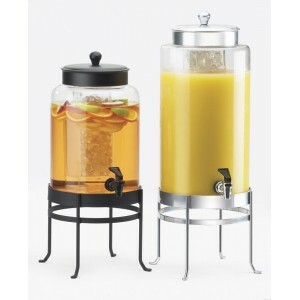 Each beverage dispenser features an ice chamber to keep your beverages cold without diluting your beverage or an infusions chamber to creat newtasty flavors, and sits securely on a removable base. Removable base for easy transportation.